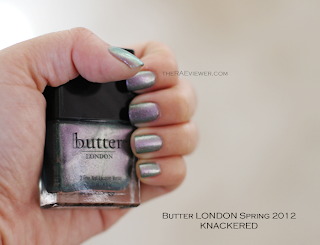 Knackered is one of Butter LONDON's Spring 2012 polishes. It is the most unique BL polish I own, and while it took me a few weeks to appreciate the duochrome effect, I officially recommend Knackered. It was quite a challenge to properly capture all the facets of the color, but nonetheless, I hope you find the photos helpful! I took the first two photos outside in shallow sunlight. The polish's green lean is strongest outdoors, while purple reigns supreme indoors. And while the purple is the main base shade, the silver metallic shots throughout the polish add to the tarnished effect. 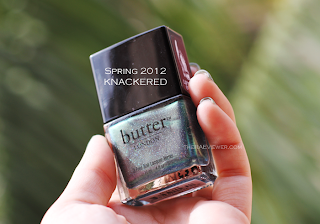 Knackered is a watery polish, but the color does build up easily and is a cinch to apply. The first coat is grey with a hint of purple, incredibly sheer. After the second coat, the silvery shade begins to develop a multi-dimensional purple gleam with shots of green glitter. The third layer coats the nails with an even layer of glitter bits, and the green duochrome comes to life! *The green duochrome at its finest! It melds seamlessly with the purple. I adore Knackered, I do. But the green, red, and silver glitter flecks are not smoothly integrated into the polish, possibly because of its ultra thin, watery formula, and that irks me. I much prefer my polish to look completely flat and smooth after using a top coat, but as evidenced above, the finished effect is still rather bumpy even when topped with two layers of Butter London's Hardware topcoat. 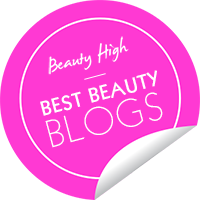 The bumpiness is only noticeable upon close inspection, however, so most people are most likely not to notice or even care. *When the nails are angle downward in sunlight, they look silver! *How Knackered looks most of the time.. mostly purple with a touch of green at the edges! Bottom Line: I purchased my Knackered polish at Nordstrom for $14. A steal, considering you get three colors (purple, silver, green) in one bottle! And best of all, I think it flatters most skin tones. It may not be the prettiest polish, but it is unique and worth the splurge! 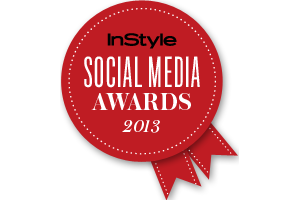 Wow, thank you so much for this post! I usually wear shades or pink, red and rose on my nails and definitely never considered wearing polish with any undertones of green but you really sold me on this product! I think it's a great price, $14, for a polish that is quite unique. 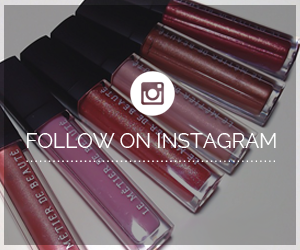 Kharina - I actually stopped using Seche Vite due to the shrinking issues. I used two layers of BL's Hardware, which is thicker than one layer of Seche Vite ;) And yes, I am aware that Knackered means tired! This such a interesting color...love it and will buy it. This was my favorite of the collection. I love layering it over purples and turquoises for different effects. I have noticed the Seche Vite doesn't take away all the glitter issues either, but I still love it. Wow this is so beautiful! 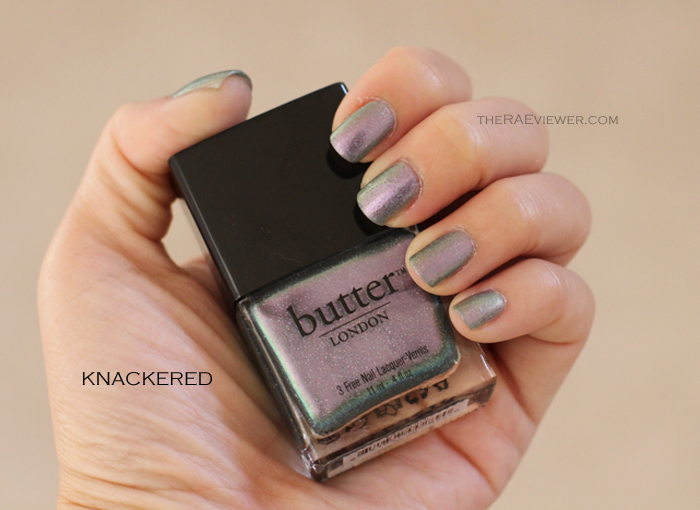 What is your all time favorite Butter London polish? 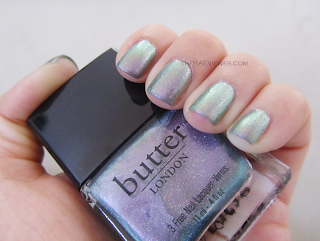 I'm thinking of purchasing some BL polishes.